Still reading Knitlandia (my goodness, does this book make me want to travel and knit) and knitting my Age of Brass and Steam Kerchief. As I'd hoped, the easy pattern is good for my knitting mojo and getting back in the crafting habit. With two little ones, a full-time job, and an old house that we haven't fully settled into yet, I need to have something pleasant but mindless to work on. Now I feel inspired to stock the cozy corners of the house with knitting baskets with projects that don't require too much concentration. 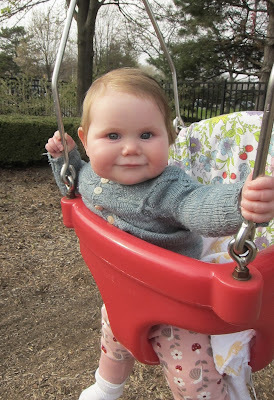 Bridget tried out the swing for the first time and loved it! 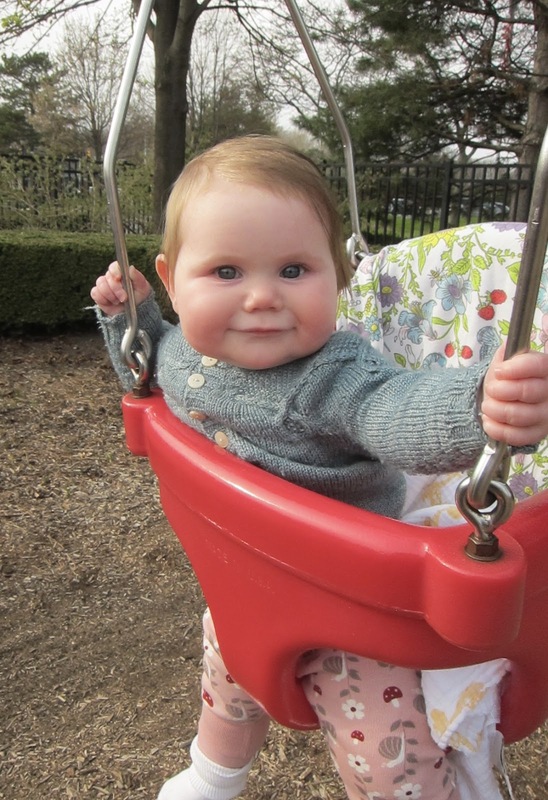 Her beautiful Pomander cardigan was knit by Rue. 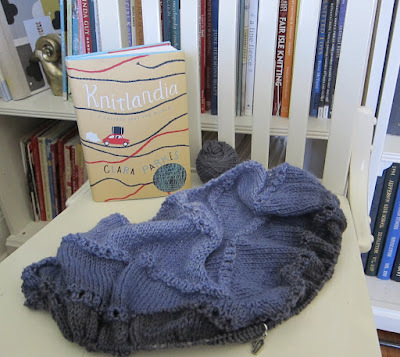 So gorgeous and cozy -- Bridget has worn this a great deal over the winter and spring. Definitely a pattern I'd like to knit. My crafting mojo has been on the wane a bit lately -- kids' tummy bugs, lack of sleep, and our first plane trip with kiddos (just Minneapolis for Easter) have taken their toll on my free time, not to mention my general sanity. Hoping to get back in the game with this easy age of brass and steam kerchief and Clara Parkes' Knitlandia, which is off to a good start. B is wearing her little garter cardi -- so sweet. The proportions are just perfect for B, which is a rarity for my long-armed, long-torso babe. I underestimated this sweater and didn't realize just how cute and cozy it would be. The yarn is Beaverslide Dry Goods Fisherman Weight, and it's wonderfully sheepy and natural, with beautiful heathered colors. If I didn't already have a yarn store's worth of wool in my house already, I'd buy more right now!